Is blanched for an hour with transitory blossom. Where is the summer, the unimaginable Zero summer?" That person who complains about the weather for the upteenth time this week. I'm hungering for sunshine and freedom and change and color. What I'm hungering for usually ends up on my plate --> this crazy colorful salad full of ingredients I don't normally like. As soon as I saw the picture of this salad in Plenty I knew I had to have it--even though I've never really liked radishes and had never seen purple radish cress in a store. I'm not even a fan of purple cabbage usually (It's the part I used to pick out of salads at restaurants) but I had to have something purple in this salad. I just had to. 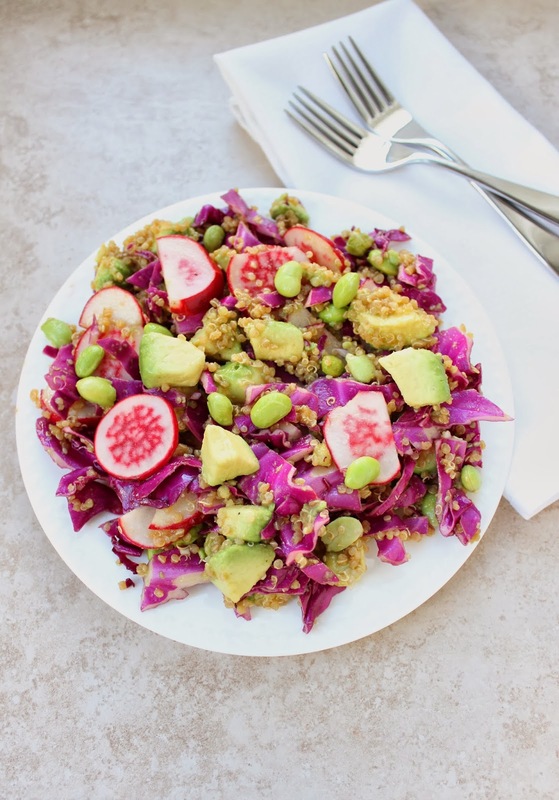 Also, it turns out that when you pickle radishes for 30 minutes with some vinegar and sugar they turn into delectable sweet crunchy components of your salad, and purple cabbage, when combined with quinoa, avocado, and smoky lemon cumin vinaigrette, morphs into something you can't get enough of. It even looks sort of magical, doesn't it? I feel like this is when I should tell you (don't hate me!) that I am going to feel the sun on my face this week. I'm flying to Panama tomorrow. I'll be sleeping in a bunk bed in a room with 20 other people, taking cold showers, eating rice and beans every day, and sweating my life away in the 90 degree weather with no air conditioning. I'll also be loving on some Panamanian children, helping sweet families with their legal needs, and generally experiencing life without cracking open a text book. I'm in dire need of a change of perspective and some more lightness in my heart. If all goes well, I'll be back next week, maybe with some photos. In a medium bowl, whisk together sugar, vinegar, and salt. Add radishes. Let sit for at least 30 minutes. Cook edamame in the microwave for 1-2 minutes or until just thawed. Meanwhile, whisk together freshly squeezed lemon juice, olive oil, and cumin. Set aside. 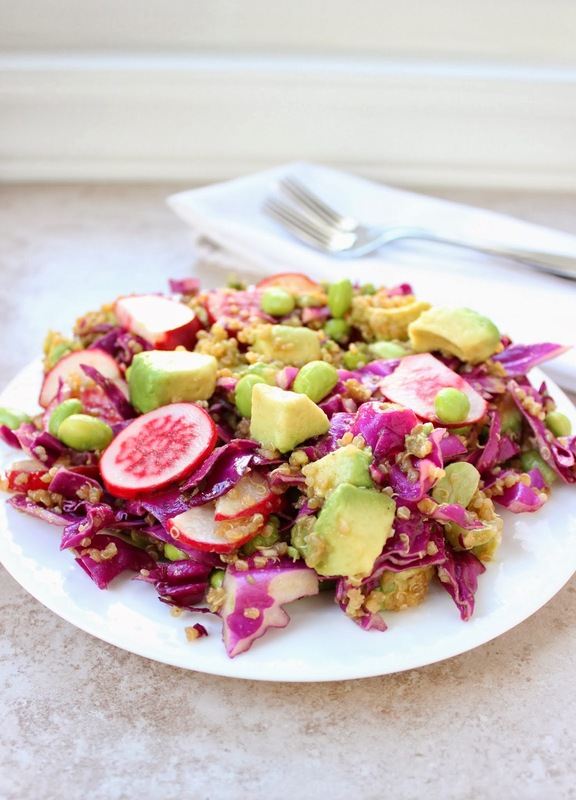 Chop cabbage and avocado into bite sized pieces. Add to a large bowl, along with the quinoa and edamame. Add in easy picked radishes and cumin lemon dressing and toss until evenly mixed. Serve immediately. 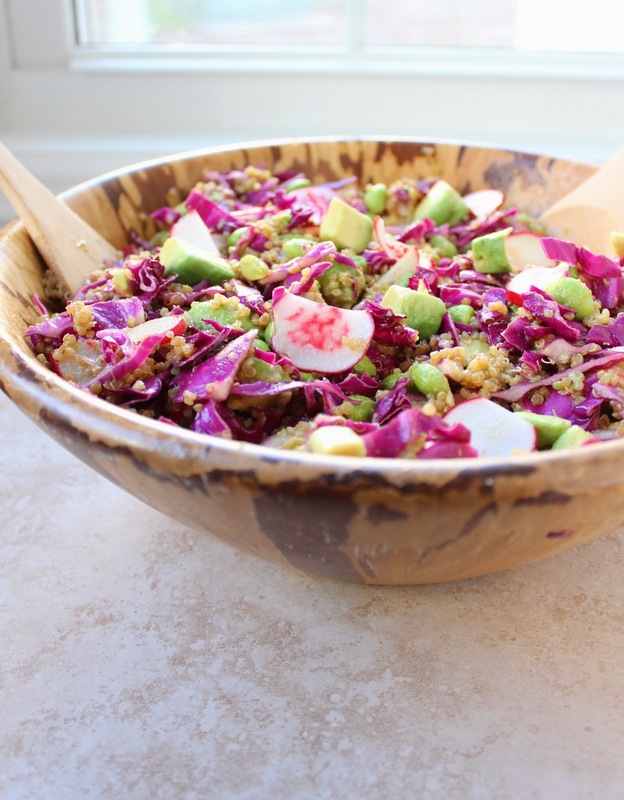 To make prep easier, cook quinoa and edamame a day ahead and refrigerate. This salad is best eaten the day it's made. 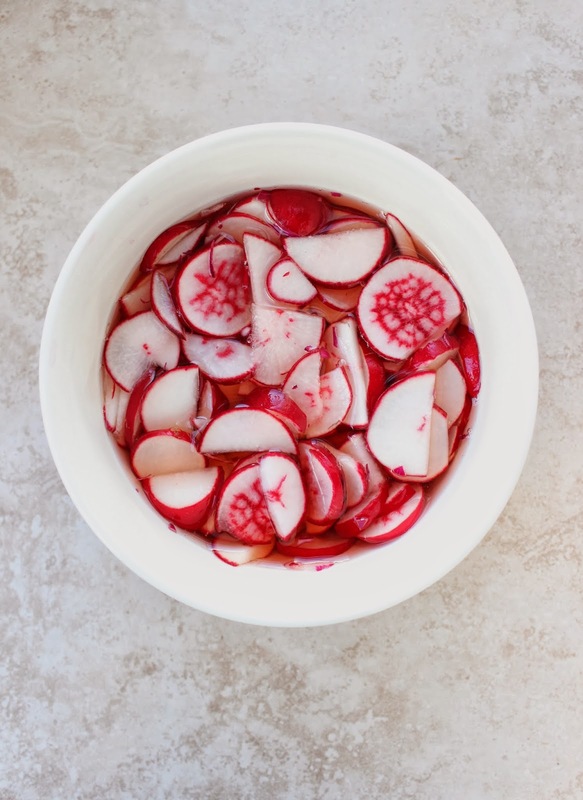 If you want it to last a few days, keep the picked radishes separate and just add to salad right before eating. The recipe makes a lot! Invite a few friends over for a midwinter spring lunch! Easy Picked Radishes adapted from Marsha Stewart. Salad inspired by Ottolenghi's Plenty. Have a wonderful & life-changing trip!!! Can't wait to hear about it. I hope you have a wonderful time in Panama! Wow! 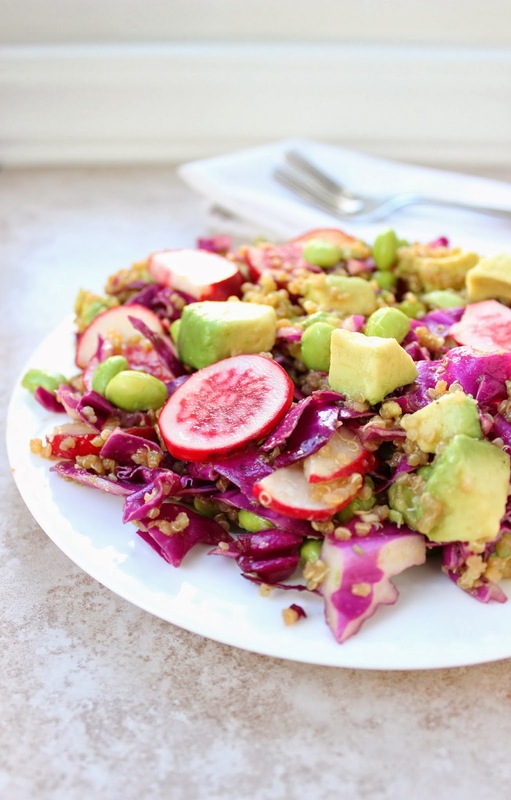 Your salad looks very lovely, too - I really love the picked radishes. Safe travels to Panama! That is so wonderful that you are offering your skills, and I hope that you have a great time too. This salad is gorgeous! I love winter radishes. Only Ottolenghi could convince me to make recipes with ingredients I don't even like...I'm not big on radishes or raw cabbage either, but I'm convinced! Have fun in Panama! Stay safe!